Protects against water infiltration around eaves, rakes, valleys, vents, chimneys and skylights. WeatherLock® G Granulated Self-Sealing Ice & Water Barrier is an essential part of the Owens Corning® Total Protection Roofing System®^. 1. The surface burning characteristics of these products have been determined in accordance with ASTM E84, UL 723, and CAN/ULC-S102. These standards should be used to measure and describe the properties of materials, products, or assemblies in response to heat and flame under controlled laboratory conditions and should not be used to describe or appraise the fire hazard or fire risk of materials, products or assemblies under actual fire conditions. However, results of this test may be used as elements of a fire risk assessment, which takes into account all of the factors, which are pertinent to an assessment of the fire hazard of a particular end use. Values are reported to the nearest 5 rating. 2. Preproduction qualification testing complete and on file. Chemical analysis of each production lot required for total conformance. 3. All values are approximate. 4. Limited to single layer applications above 650°F (343°C), but not greater than 6" (152mm) thickness. 5. With heat up schedule. 6. The surface burning characteristics of these products have been determined in accordance with UL 723, ASTM E84 or CAN/ULC-S102. Values are reported to the nearest 5 rating. 8. Maximum allowable thickness at 1,000°F (538°C): Type I-HP - 8.5" (216mm); Type II-HP - 6"(152mm). 9. The surface burning characteristics of these products have been determined in accordance with UL 723, ASTM E84 or CAN/ULC-S102. These should be used to measure and describe the properties of materials, products or assemblies in response to heat and flame under controlled laboratory conditions and should not be used to describe or appraise the fire hazard or fire risk of materials, products or assemblies under actual fire conditions. However, results of this test may be used as elements of a fire risk assessment which takes into account all of the factors which are pertinent to an assessment of the fire hazard of a particular end use. Values are reported to the nearest 5 rating. 10. Preproduction qualification testing complete and on file. Chemical analysis of each production lot testing required for total conformance. 11. 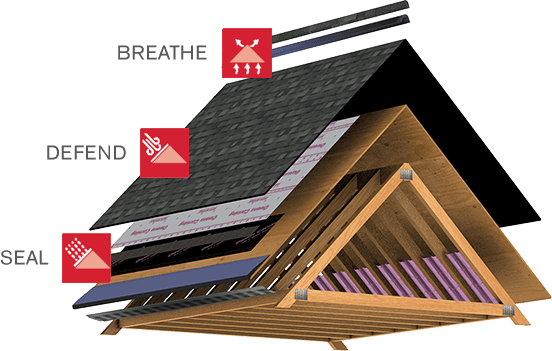 It is critical to have the right amount of intake ventilation and to adequately seal the attic floor to prevent pulling air from conditioned space. 12. For each Gable Mount fan, Owens Corning Roofing requires 890 square inches of intake. See instructions for details. 13. For each Roof Mount fan, Owens Corning Roofing requires 600 square inches of intake. See instructions for details. * Ensure proper ventilation is met when applied over the entire roof deck. ^ Excludes non–Owens Corning™ Roofing Products such as flashing, fasteners and wood decking. UL Class A Fire Resistance applies when installed under asphalt shingles and quarry slate.